FREE Indy Music Ringtones... From Twitter to your phone! If you have a Twitter Account, follow MyxerTones to receive your daily TwitTone. Not on Twitter yet? Go to Twitter and register. Then add MyxerTones! As fans of all things Mobile, we were early adopters of Twitter and love getting Tweets from all our friends... We built the Myxer Platform to radically simplify mobile content and services so it seemed logical to use the text messages going to our Twitter Followers to deliver FREE RINGTONES from our catalog of Independent Artists. More than 100,000 bands are using Myxer to create and share Ringtones from their music, so we have a humongous catalog of great content from tremendously talented bands in every music genre. Now our Twitter Followers can get a daily taste from TwitTones! Enjoy! Are you in a band??? Learn how you can create, share and sell ringtones of your music. Check out the links in the sidebar! To get your daily TwitTone go to Twitter and Follow MyxerTones. Welcome Twitizens! TwitTones delivers daily FREE ringtones right to your Twitter account. Add "MyxerTones" as a Twitter Follower and you will receive a daily TWEET containing a link to a FREE Indy Music Ringtone from Myxer! Can't Wait? If you have your Twitter messages sent to your mobile phone, you can download your daily ringtone right from your phone! ARE YOU IN A BAND??? 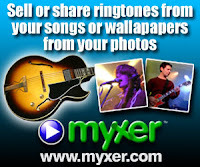 If you are a musician or in a band and want to see your music as a TwitTone just visit Myxer.com and register! Become a MyxerIndie (its FREE) and you can create, share and even sell your own ringtones and wallpapers right from your own website, blog, or MySpace page! Going Mobile is not just for the majors! Let Myxer help you Mobilize and Monetize your music today! (c) Copyright 2007 Myxer Inc. All Rights Reserved.